Life in the midst of moving is hectic and stressful. We've had to deal with Comcast ripping us off (surprised? no), continuing to move our massive amount of stuff from our old place to our new place, our first plumber bill (which we instigated - we're making a closet into a laundry room... more on that later), the dogs and cat acclimating, a soggy mattress, the wrong paint colors, cleaning, organizing, and so on. We deserved a bit of a break and Jake's parents provided us with the perfect opportunity. 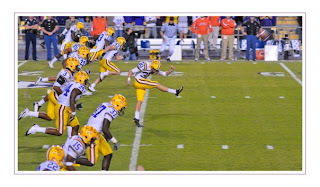 Jake's brother Josh plays football for LSU - that is him kicking in the picture above. We wish we could get down to see him more than we do, but for the past two years we've seen him play a fair amount - we went to Kentucky and the SEC Championship in '07. Jake got to go with his family to the National Championship as well that year to see Josh. 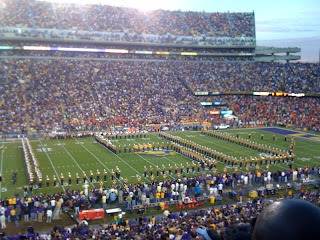 Last year, we went to the LSU-Tulane game. That was a really fun trip because it was Halloween that Friday and we went to New Orleans first. We hadn't been able to go yet this year so we were glad when Jake's parents wanted us to come see them play Auburn. Jake's cousins were coming up from Dothan and we hardly get to see them so it was sure to be a great family weekend. We drove down Friday night with Jake's parents and sister. We got in pretty late so we ate at a local food place (I can't remember the name - Sammy's?) and got our first bites of Cajun food for the weekend. Jake and his dad both had a plate of jambalaya and Jake's sister and mom had shrimp. I stuck with the hamburger - if you know me, you know I don't like seafood. We went back to the hotel (a very nice Drury Inn just a short drive from campus) and crashed. Saturday was all about tailgating and the game. The Jaspers are serious tailgaters now - they have a tent, a tv with a satellite dish, catered food, and a whole slew of Memphis friends to party with. We picked the food up from this grocery store called Tony's and they had live catfish in a pool where you picked out your fish, they got it, laid it out on the floor for you to approve, then hung it on a rope for you at the counter. They also had frog leg meat in the meat deli - not your typical grocery store. 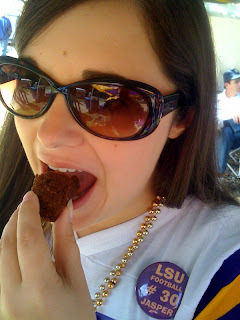 My personal favorite as usual were the boudain balls - they are pork and rice mixtures fried in breading. 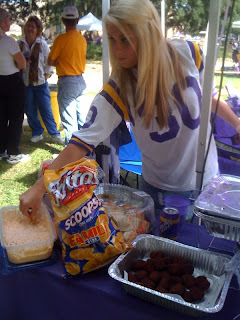 I absolutely love them and they are a staple of an LSU tailgate. In addition to boudain balls, Jake's mom got gumbo and made a corn dip that was perfect. It had corn, cheese, jalepenos, and more. It was infectiously good. Clearly from the picture above, I wasn't the only one that loved it - Jake's sister Colby is modelling the dip for us. After a few hours of tailgating, people watching, and hanging out with Jake's cousins, we headed in to the stadium. Jake's parents got me a #30 jersey for my birthday and I had been waiting for an opportunity to wear it. 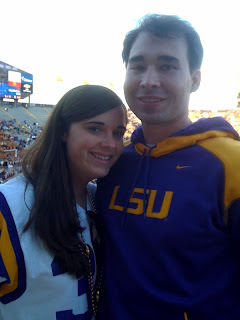 We were all decked out in LSU gear. After the game, we waited for Josh to get out of the locker room. 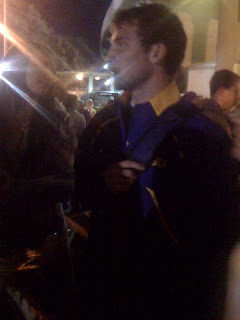 We stood with all the groupies and autograph seekers and eventually Josh ventured out. I hadn't seen him since this summer and so it was great to hang out with him. He hung out with us for a bit before we headed back to the hotel. Sunday we hit the road after a lunch with the family. All in all, it was a great trip. I love Jake's immediate and extended family and weekend getaways are always appreciated. Hey, I think we were in New Orleans the same weekend.